In my blog, The Cofer/Copher Families- Part 2 , I ended up letting you know that Thomas Cofer II’s line continues with his parent’s, Thomas Cofer, Sr. and “Oliff” Olive Ward. They lived their lives in Isle of Wight, VA. They had nine children, slaves, and land. Thomas Cofer, Sr.’s parents were John Coffer and Jane Bennett. Janes’ father was Richard Bennett, Jr. Richard Bennett’s father, was Richard Bennett, Sr.
And, this is where I begin this blog. Richard Sr. married Anne Barham. Richard Bennett, Sr. and Elizabeth Pierce are half siblings. This is the Elizabeth Pierce who was engaged to a John Filmer when he died. He left his estate to her. It is not known exactly how this John is related to the Filmer’s. However, there is still a lot of discussion about Anthony Barham who mentions his “brother-in-law Richard Bennett” and to “Mother Bennett” per Barham’s 1641 will. A lot of genealogists concur that the relationship was by way of Anthony Barham’s marriage to Elizabeth Pierce, a child of Alice Pierce’s first marriage before Thomas Bennett. There are a several others who use the same will of Anthony thinking that perhaps Anne was a sister of Anthony Barham, but I have not found anything to substantiate this. Regardless, there is quite the royal pedigree with the Barham’s. MeMa, Ruby Chapman Wescott, would have been quite tickled at the Royal lineage that this line has. Katherine was the third daughter of Sir Edward Filmer and Elizabeth Argall. Her uncle was Captain Samuel Argall who opened a new and safer route from Portsmouth, England to Jamestown in 1609. In 1613 he led the expedition that captured Pocahontas, an Indian Princess and brought her to Jamestown as a hostage in order to keep local Indians from attacking the settlement. Katherine’s nephew, Sir Robert’s first son, is Sir Edward Filmer. He was Gentleman of the Privy Chamber both to king Charles I and II. A Privy chamber was the private apartment of a royal residence in England. The gentlemen of the Privy chamber were servants to the Crown who would wait and attend to the King and Queen at court during their various activities, functions and entertainments. Robert’s cousin was Nicholas Barham of Chillington, Queen Elizabeth’s Sergeant-At-Law and a Member of Parliament. In 1572, Nicholas conducted the prosecution of the Duke of Norfolk for conspiring with Mary (Queen of Scotts) to kill Queen Elizabeth. Both the Duke and Mary were beheaded. The following February Barham was engaged in prosecuting the duke’s secretary, Robert Higford, at the Court of Queen’s Bench, on the charge of adhering to and comforting the queen’s enemies. Higford was found guilty and, like his master, condemned to death. The Filmer’s owned East Sutton Estate through “John Argall, who sold this manor to his brother-in-law, Sir Edward Filmer. The family of Filmer was originally seated at the manor of Herst, in the parish of Otterden, where Robert Filmer lived in King Edward the II’s reign.” (Source: Edward Hasted, ‘Parishes: East Sutton’, in The History and Topographical Survey of the County of Kent: Volume 5 (Canterbury, 1798), pp. 375-385. British History Online http://www.british-history.ac.uk/survey-kent/vol5/pp375-385). Pictures courtesy of June and Larry Shaputis, Jim Clark and Paul Lauff, who were allowed to take pictures and videos in October 2007 of some of the public areas inside the manor, the manor grounds, and inside the nearby church where many of the Filmer family are buried. Other photos owned by the people above and the East Sutton Prison can be viewed at the links below. Here you can see the inside of the churches and the estate. The pictures from the church at the above link have beautiful images of dedications to our ancestors. Edward died and the East Sutton Estate passed to his brother Robert who was created a baronet (the holder of a rank of honor below a baron and above a knight) in 1674 in honour of their father’s loyalty to the Crown. Katherine’s sister, Elizabeth, married William Faulkner “citizen & draper of London”. Both her father and brother, Reginald Filmer, had extensive business dealings in London in the early 17th Century and is how they met William Faulkner. They were the parents of John Forkner (Faulkner), Sr., a leather craftsman, specializing in footwear, who emigrated to Maryland in 1665 with his wife. Members of the Faulkner line served in the American Revolution. Katherine Barham’s will was dated November 1, 1662; her son Richard was the executor. 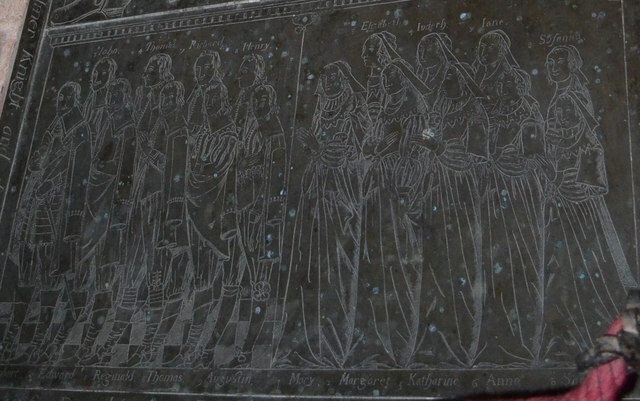 Elizabeth Argall and Edward Filmer, together for fourty four years, had 9 sons and 9 daughters as seen in this burial brass plate at their burial place. Father, Mother, nine sons bottom left, nine daughters bottom right. Katherine’s mother was Elizabeth Argall, whose brother was governor of Virginia; her grandmother was Mary Scott, daughter of Sir Reginald Scott of Scotts Hall, Kent. (Scot’s Hall (or Scott’s Hall) was a country house in Smeeth, between Ashford and Folkestone in southeast England. It was the property of a gentry family, the Scotts. ) There was a time when one could ride from Scot’s Hall to London without leaving Scott Property, according to JR Scott. But, according to the Guardian.com, “we are all special, which means none of us are. If you’re vaguely of European extraction, you are also the fruits of Charlemagne’s prodigious loins. A fecund ruler, he sired at least 18 children by motley wives and concubines, including Charles the Younger, Pippin the Hunchback, Drogo of Metz, Hruodrud, Ruodhaid, and not forgetting Hugh.” He is also Cindy Crawford’s 41st-great-grandfather and my 40th great grandfather. Agh, the tangled vines we weave. Well, I like to think I am pretty special, coming from such lineage. Don’t you? Thank you for presenting the genealogy in such an interesting and succinct way! My Barham lineage is through Judkins Barham (d ca 1838 in NC), son of Robert Barham of VA. I am a 6th generation Arkansan now living in my Barham ancestors’ VA, and an avid Barham researcher. Is there a chance you know “for sure” the father of Thomas Bennett (b. 1580)? Would Edward happen to be the brother of Thomas? Thanks so much! Hi Fredda, thanks for reading. I replied to your email and sent you the page from Southern Historical Families I, page 72. Thanks again and let me know if can help. Your email address bounced back. If you provid your email address, I’ll be happy to respond with the source. Your email address bounced back. If you provide your email address, I’ll be happy to respond with the source. Next Next post: Johann Schittkowski, relative?